“This whole game is just designed to make us hate ourselves.”—Shay Uglies told Tally Youngblood’s version of life in Uglyville and the budding rebellion against the Specials. Now comes an exciting graphic novel revealing new adventures in the Uglies world—as seen through the eyes of Shay, Tally’s rebellious best friend who’s not afraid to break the rules, no matter the c “This whole game is just designed to make us hate ourselves.”—Shay Uglies told Tally Youngblood’s version of life in Uglyville and the budding rebellion against the Specials. 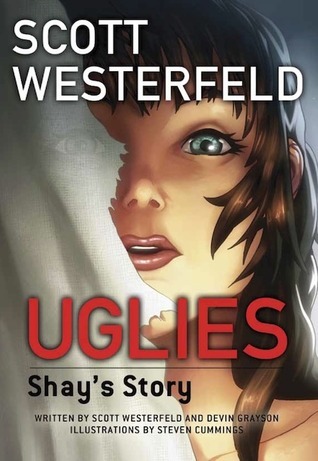 Now comes an exciting graphic novel revealing new adventures in the Uglies world—as seen through the eyes of Shay, Tally’s rebellious best friend who’s not afraid to break the rules, no matter the cost. A few months shy of her sixteenth birthday, Shay eagerly awaits her turn to become a Pretty—a rite-of-passage operation called “the Surge” that transforms ordinary Uglies into paragons of beauty. Yet after befriending the Crims, a group of fellow teens who refuse to take anything in society at face value, Shay starts to question the whole concept. And as the Crims explore beyond the monitored borders of Uglyville into the forbidden, ungoverned wild, Shay must choose between the perks of being Pretty and the rewards of being real.